The last time I was in the Emergency Room with my Little Toughie was a month after her spinal surgery when she was 5 months old. A severe kidney infection landed her a few days in the hospital. God bless the parents and caretakers of children who have chronic or long-term illness. I don't know how they do it. 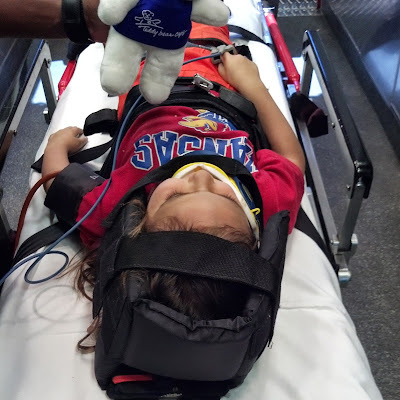 The last time I was in a ambulance with a kid was when my son had a rectal prolapse while at school (he was a Kindergartner). Since school staff isn't allowed in the bathrooms or even allowed to help the kids, the prolapse would not go back in. They finally called me and when I got there, it was too late. I had to call 911. Funny thing is, when we got the Emergency Room, the doctor took one look at him and said, "Sugar". He had a nurse get a cup of sugar from the cafeteria and pour it over the prolapse. It took a couple of minutes, but it went back in on its own. THAT is how dehydrating sugar is! Today my daughter is playing and back to normal as if nothing happened. "Little Toughie" is the name she gave herself when both kids were participating in Kids CrossFit. She has surely lived up to it. There is a certain bravery in my daughter that I admire and envy. She is one to take on a challenge and to never back down from trying something new. She is one who, should she fall off of a horse, would show or tell that horse a thing or two and then get right back on...over and over again. We thank God that she was not severely injured; that all she has to deal with is a little soreness. Early on during the book club meeting, another mom and I briefly shared the exasperation we were both having with our boys and she reminded me that God only gives us what He knows we can handle. God had His Almighty hand on my daughter yesterday and gave me only what I could handle.